Popcorn or popping corn is a special type of corn grain that explodes from the kernel and puffs up when heated. Popcorn was originally discovered by Native Americans and have since become a popular snack food. Popcorn is usually served salted or sweetened. 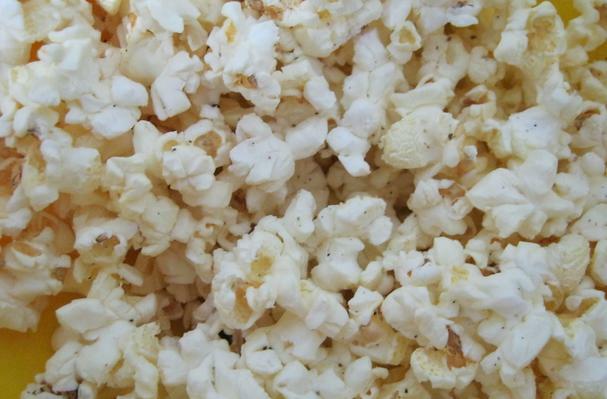 Air popped popcorn is high in fiber, low in calories, fat, sugar and sodium. A popped kernel of corn is known as a "flake". Two shapes of flakes are commercially important. "Butterfly" flakes are irregular in shape and have a number of protruding "wings". "Mushroom" flakes are largely ball-shaped, with few wings. Butterfly flakes are regarded as having better mouthfeel, with greater tenderness and less noticeable hulls. Mushroom flakes are less fragile than butterfly flakes and are therefore often used for packaged popcorn or confectionery, such as caramel corn. Choosing: While the kernels may come in a variety of colors, the popped corn is always off-yellow or white as it is only the hull (or pericarp) that is colored. "Rice" type popcorns have a long kernel pointed at both ends; "pearl" type kernels are rounded at the top. Commercial popcorn production has moved mostly to pearl types. Historically, pearl popcorns were usually yellow and rice popcorns usually white. Today both shapes are available in both colors, as well as others including black, red, and variegated. Commercial production is dominated by white and yellow. Buying: Dried corn kernels are sold in large bags at food markets. Microwaveable bags filled with corn kernels and seasonings (typically including oil and/or butter) are widely available as well. Procuring: Popcorn will pop when freshly harvested, but not well: its high moisture content leads to poor expansion and chewy pieces of popcorn. Kernels with a high moisture content are also susceptible to mold when stored. For these reasons, popcorn growers and distributors dry the kernels until they reach the moisture level at which they expand the most. This differs by variety and conditions, but is generally in the range of 14–15% moisture by weight. If the kernels are over-dried, the expansion rate will suffer and the percentage of kernels that pop at all will decline. Popcorn is usually served salted or sweetened. In North America, it is traditionally served salted, although sweetened versions, such as caramel corn and kettle corn, are also commonly available. In the United Kingdom, ready-made popcorn is available either salted or simply sweetened with sugar, both varieties being equally popular. Popcorn is a popular snack at sporting events and in cinemas, where it has been served since 1912. Although small quantities can be popped in a stovetop kettle in a home kitchen, commercial sale of freshly popped popcorn employs specially designed popcorn machines, which were invented in Chicago, Illinois by Charles Cretors in 1885. Individual consumers can also buy and use specialized popping appliances that typically generate no more than a gallon of popped corn per batch. Some of these appliances also accept a small volume of oil or melted butter to assist thermal transfer from a stationary heating element, but others are "air poppers" which rapidly circulate heated air up through the interior, keeping the unpopped kernels in motion to avoid burning and blowing the popped kernels out through the chute. However, the great majority of popcorn sold for home consumption is now packaged for use in a microwave oven. A very different method of popcorn-making can still be seen on the streets of some Chinese cities today. The corn is poured into a large cast-iron canister- sometimes called a 'popcorn hammer'- that is then sealed with a heavy lid and slowly turned over a curbside fire in rotisserie fashion. When a pressure gauge on the canister reaches a certain level, it is removed from the fire, a large canvas sack is put over the lid, and the seal is released. With a huge boom, all of the popcorn explodes at once and is poured into the sack. Airtight containers -- plastic or glass -- are your best bet to avoid moisture loss, especially when stored in a cool place like a cupboard. Avoid the refrigerator. Some say the cold storage makes the popcorn taste better, but many refrigerators contain little moisture and can dry out kernels. During the Great Depression, popcorn was comparatively cheap at 5-10 cents a bag and became popular. Thus, while other businesses failed, the popcorn business thrived and became a source of income for some struggling farmers. During World War II, sugar rations diminished candy production, causing Americans to eat three times more popcorn than they had before. History: Popcorn was first discovered thousands of years ago by the Native Americans. Some tribes believed that the popping noise was that of an angry god who escaped the kernel. The English who came to America in the 16th and 17th centuries learned about popcorn from the Native Americans.